CR 46101R ex EL C-133 same as class N-3 at Berea, OH. Photo by Dan Dorko 54k I would really like to have a photo of an N-3 in blue, does anyone have one they would like to contribute? 52 cars 19600,19654,19660 ex EL ex ERIE C-100 to C-169. Riveted steel cupola type, built 1941. Only 3 of these cars were renumbered and got blue paint, a few more were assigned to M of W service, most were scrapped. Some of these cars were built with high speed trucks similar to those used on the Erie milk cars. 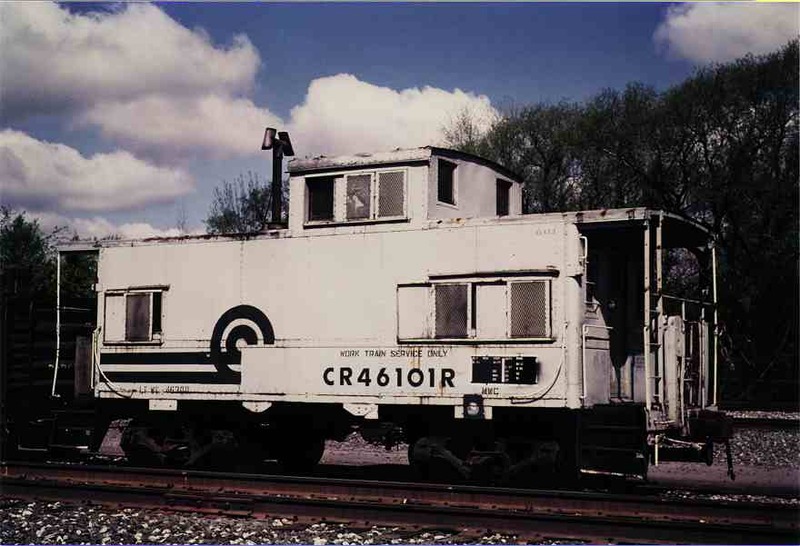 Outline created from photos of CR 19674(N-3A) and CR 46101 by T.W.Wolfgang. with the exception of riveted vs welded construction. Scratchbuilding this one is your only choice, it is quite different from any available model. I am not aware of any brass models either. The drawing on the N-3A page is close and with the addition of some rivet detail could be used to build an acceptable model from styrene.